The Israel Cancer Association (ICA) invites you to join the fight against cancer in Israel and count yourself among the ICA's friends and supporters in Israel and around the world. The war on cancer is our common battle and any donation is potentially life-saving. We suggest that you inscribe and/or honor a family member, friend or any other individual of your choice, in the Book of Life. You may commemorate important and meaningful events in your life, or in the lives of those you cherish, in the Book of Life. An inscription in the Book of Life makes for a unique and value-oriented gift honoring close relatives and friends. The inscription remains forever engraved, as an integral part of the fight against cancer in Israel. A name or event inscribed in the Book of Life awards the donor, or any other individual whom the donor wishes to honor, with a special certificate enclosed in a ornate frame. 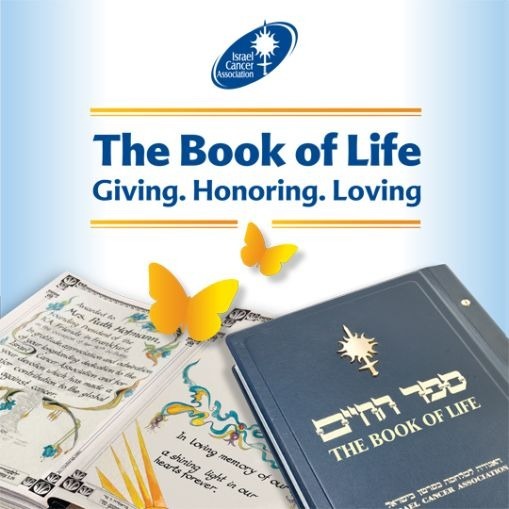 The Book of Life is on permanent display at the Israel Cancer Association Headquarters - Beit Mati* in Givatayim. Half a page in the Book: 1,000 US$. A full page: 1,800 US$ or more. A contribution made to the Israel Cancer Association in Israel is tax-deductible under Section 46a of the Income Tax Ordinance (tax credit is calculated at 35% of the donation). *The Israel Cancer Association Administrative Office building in memory of Mati Recanati, may her memory be for a blessing.